With a trip to deepest, darkest Scotland in the offing this coming weekend, England manager Gareth Southgate took one look at his squad and decided a bit of intensive training was required. 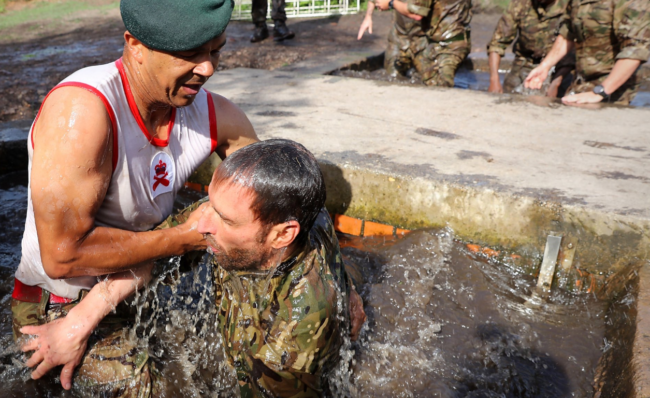 As such, the England players and staff spent 48 gruelling hours (Saturday and Sunday) under the command of the Royal Marines at their training centre in Devon. An incredible experience for the #ThreeLions. The players were put to it, with the Marines ‘treating’ their guests to four-mile, heavily-laden hikes, various assault courses and an overnight survival camping excursion. An unforgettable experience for the #ThreeLions. Have you ever seen a less convincing soldier than Adam ‘as moisturised by Nivea’ Lallana? Harry Kane, however, could easily play a stout, salt-of-the-earth lance corporal in any war film from any time period between 1914 and today. Yeah it is kinda cringey. I enjoyed the photos of Sterling getting dunked and Superlamblallana looking like the least likely to actually go into battle. At least Hart fitted the part. Wow, Fraser Forster and to a bit lesser extent, Joe Hart, really do look the part! I suspect you lot could train with the Royal Ballet and still beat Scotland. We’ll put up a ‘brave performance’, no doubt.